Getting Grounded at 25,000 Feet! 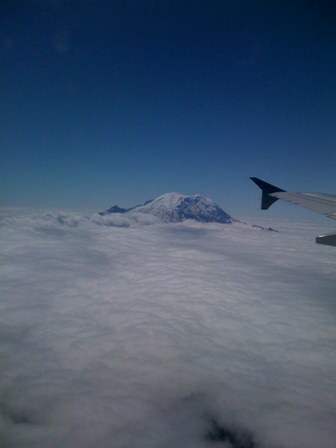 This is Mt Rainier peaking through the clouds at 25,000 ft and the plane was probably 100 miles away from the mountain! Couldn’t help but share this view it happens to be one of my favorites. I usually try to plan my seating on the side of the plane that I get to see Mt Rainier. Today I was really lucky, I had to change planes in Phoenix and the ride up to the Northwest gave us great views of Mt Shasta, Mt Hood, Mt Baker and Mt Rainier. What is even more amazing is that we could see all 4 mountains at once – Whoa moment! Once I landed at Sea-Tac the clouds took over and the view was gone. The weather is awesome – 70 degrees, sunny with some clouds, the sea gulls are busy, the air smells of cedar and evergreen, the flowers are all in bloom and the emerald green of the Northwest provides an amazing background for the blue water, the colors of the wild flowers and the snow on the mountains. After a few great shots of espresso from Batdorf and Bronson’s Dancing Goats Bar at the Market and their Coffee House on Capital and then another shot of espresso at Cafe Vita I set out to find myself a bike. The guys at the Bike Stand were great. The bike is a tad small but a few more adjustments with the seat post and saddle will do it. 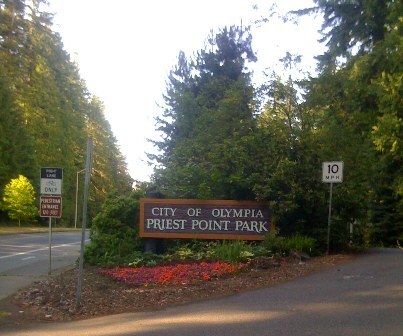 I spent most of the evening riding around Oly. I road out East Bay Road to Priest Point Park ( the view of the Bay is awesome) did some of the trails and then continued on East Bay to Boston Harbor Road. I had a hard time getting off my bike but I was exhausted after traveling all day. 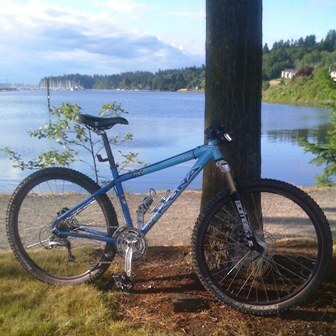 Ok, let’s review- Mt Rainier, excellent coffee and getting to hang out at 3 different espresso bars, the sights and smells of the Northwest all on a bike – Yes,Yes, Yes, I’m bringing home the Panama Esmeralda!